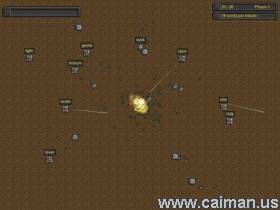 Caiman free games: Typogun by Pondwater. 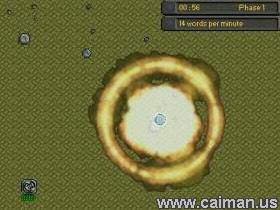 Typogun is a very original game with great crisp graphics and good sound that any good overhead shoot em up gamemaker would be jealous of, this game has got a very good educational stlye if you want to improve your typing in a shoot em up style, the words seem to start of slow and small as they creep across the screen towards your turret, after destroying certain words they leave powerups for you to shoot, take a shot at these to see what you can get, i am not the fastest at typing but i still enjoyed playing this educational game, i could not get of the first level but i am sure someone who can type will do this with ease. To help improve my typing skills i will use this as it is Fun. Typogun is equipped with two different suitable mp3s that are included externally to improve loading time and so you can replace them with your own mp3s of the same filename.